Letting a cat go outside doesn’t necessarily mean just opening the door and letting him go. There are all kinds of ways to keep a cat safe outside. Leash training a cat is easier than you may think. Or try supervised outdoor time. Most cats love hanging out with their humans outside, and if you’re outdoors, your cat will probably stay right with you. Walk around the yard together, or work in the garden, or just sit in the grass and enjoy the sunshine and fresh air with each other. This is one of my favorite things to do! If your cat wanders further than you want him to go, don’t run after him. A cat can outrun a human anytime. Walk a few feet behind him and pick him up when he stops to eat some grass or watch a bird flying by. When you’re back inside, give him some treats or wet food as a reward for going in when you want him to. Another way to keep cats safe outside is to build an outdoor enclosure. It doesn’t have to be elaborate, just large enough for the cats to have room to run and chase the bugs flying by. At least some of the enclosure should be on the ground, not a patio, so the cats can roll around in the dirt and nibble grass. If you have a fence, putting PVC piping on top of the fence is another way of keeping the cat in your yard. Cats are creatures of habit, and if you establish a routine for letting a free roaming cat go outside, he’ll probably be there waiting when you want him to come in. 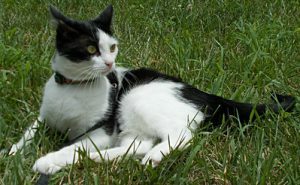 Having a predictable indoor/outdoor schedule is one way of keeping cats safe outside. First, establish your own routine. Decide when you’re going to let him out and back in and try to let him out and in at about the same times every day. For most cats, food is a powerful motivator. If you give your cat wet food the second he comes in, he’ll be at the door waiting at dinnertime. If he doesn’t eat wet food, give him some treats as a reward for showing up when you want him to. You can also establish a routine for taking a cat out on a harness and leash so he doesn’t nag you nonstop to go outside. Try to establish a consistent walking schedule. Will you go out every day when you get home from work? Or will you go out just on weekends, after you’ve finished running errands and doing your weekend chores? At the time you’ve chosen, get the cat’s harness and leash out and ask him if he wants to go outside. Use the same words every time you go out. He’ll learn your cues, get used to your schedule and won’t ask to go out at other times. Give him some wet food or treats when you’re back inside as a thank-you for coming in when you’re ready. To help keep your cats safe outside, get them microchipped. They should also wear collars with tags with your phone number on them. Keep your cat inside on Halloween, New Year’s Eve and the Fourth of July. It’s too noisy and too busy outside on those holidays for cats to be outdoors. It’s also a good idea to make sure your cat is inside during heavy storms or when there’s a lot of snow on the ground. Snow can cover his familiar scents and the signposts he created with his claws. If your cat doesn’t come home within a few hours of his usual time, begin searching for him immediately. Look under bushes, in trees and inside neighbors’ sheds and garages. Post fliers and file a lost report with your local animal control agency. The longer your cat is missing, the harder he’ll be to find. There are many hazards in this world, both indoors and outdoors. But with some thought and planning, there are ways to keep cats safe outside, or at least as safe as possible.